Laser therapy is a new, noninvasive, painless and side-effect free therapeutic treatment offered by Winter Park Veterinary Hospital for your dog or cat. Laser therapy has been scientifically proven to be successful in treating post-surgical pain and many other conditions such as arthritis, back pain and inflammatory conditions. It has offered a new lease on life for countless senior pets suffering from arthritis and degenerative joint disease. It uses a beam of laser light to deeply penetrate tissue without damaging it. It induces a biological response in the cells which leads to reduced pain, inflammation and increases the speed of healing. Most treatments only take a matter of minutes. 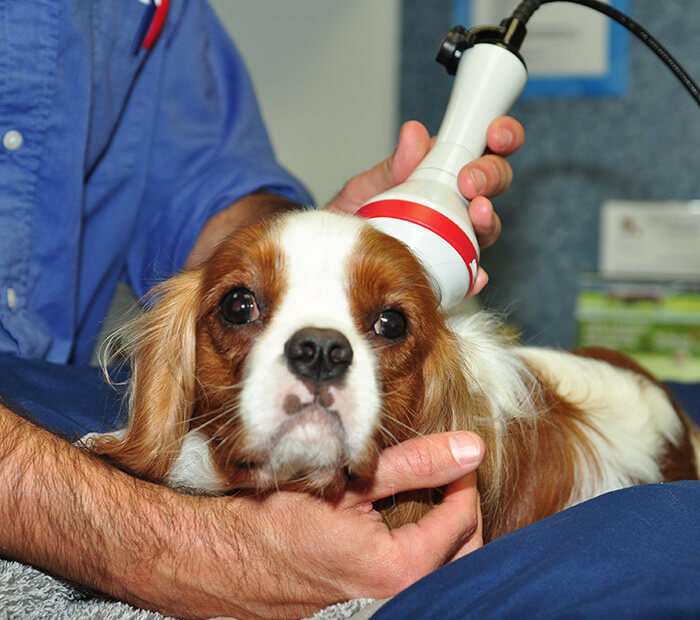 Laser Therapy is used to treat a variety of injuries and illnesses your pet might be experiencing. It can also increase your pet’s joint flexibility and relieve any joint pain your dog or cat might feel, especially in senior pets. Treatment protocols are unique to each patient and condition. Treatments vary in time, complexity and costs. Laser therapy can also be used to enhance other treatment plan recommended by us. Please call us to schedule a consultation if you feel your dog or cat could benefit from this wonderful new treatment.